GoToWebinar is one a popular tool for hosting and running webinars. 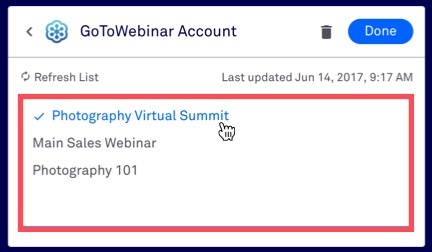 If you have an account, you can connect a specific webinar to Leadpages to register new leads. Check out the guide below to learn how to integrate and configure your conversion tools to work with GoToWebinar. We don’t currently integrate with GoToMeeting or other Citrix products—you must have a GoToWebinar account to connect with Leadpages. Drag & Drop Builder: To use GoToWebinar with our Drag & Drop page and site builder and pop-ups, follow our guide here: Connect Your Integrations (Drag & Drop Builder). Standard Builder: Follow the steps here to use GoToWebinar with Standard Lead Pages, opt-in texts, or trigger links. NOTE: Only active/future webinars will appear in Leadpages; past webinars aren’t included in the integration list. Webinars are listed by title in Leadpages. In our Standard Builder, opt-in texts, and trigger links, session dates are also listed. If you have a lot of webinars, we recommend giving each webinar a unique, identifiable name in GoToWebinar, e.g. “July Training - 10 AM Session”. That way, you can easily tell in Leadpages which webinar you’d like to connect to. You can find detailed steps on how to configure integration settings for all our conversion tools here: Choose a Destination for your Leads. GoToWebinar requires you to collect email, first name, and last name fields. In addition to those three, you can add registration questions to collect other information from registrants. Things get a little tricky if you use GoToWebinar with another service simultaneously. You’ll want to make sure you use first and last name fields from that service if possible—otherwise you may end up with multiple name fields on your form. Also keep in mind that GoToWebinar must have a matching registration question to collect form data. For example, if you added a birthday field to your form from another service, that data wouldn’t pass through to GoToWebinar. In your form settings, hide the first name field and give it a default value (such as “Friend”). Hide the last name field, then give it a default value (such as “.” or a space). TIP: Our Standard Builder automatically allows you to hide first and last name fields if you configure GoToWebinar as your secondary integration (in the “Integrate with Webinar Host” section). Opt-in texts automatically skip first and last name fields when used with GoToWebinar. In that case, “first name” will be populated with “Friend”, and last name will be populated with a comma. You can adjust email settings for each webinar—for instance turn off the confirmation email or adjust reminder email timing. For details, check out GoToWebinar’s guide here. Does Leadpages support recurring webinars? Why do I see duplicates of the same webinar in Leadpages? We treat each webinar session as a seperate event; GoToWebinar treats recurring webinars as one event with multiple sessions. Each form in Ledapages can only integrate with one webinar session. Unfortunately, it’s not possible to give recurring sessions unique names—so while we support them, it’ll be difficult to tell sessions apart within Leadpages. As an alternative, consider copying past one-time webinars. What’s the difference between a registrant and attendee? Anyone who signs up for a webinar is considered a registrant before the webinar airs. The same person can register for multiple webinars. People who actually join (attend) a webinar are considered attendees. NOTE: Each session has an attendee limit determined by your GoToWebinar account level. It’s often possible to have more registrants than attendees.